Traditional Japanese kimonos are going on sale this weekend at both Kadena Air Base and the Okinawa Convention Center, and prices have never been lower. The ninth annual Kimono Sale will take place at the Kadena Air Base Officers Club Sunday and Monday, and at the Convention Center Tuesday and Wednesday. The event is sponsored by the Kimono Recycling Shop in Tokyo, offering slightly used kimonos at a fraction of their original cost. 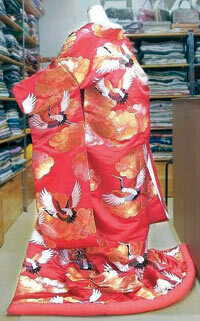 The used kimonos are all clean and in excellent condition, says a Kimono Recycling Shop official. The kimonos were previously used in wedding halls and rental shops. Available are silk kimonos in styles designed for both married and single women will be available, as will obi belts for both formal dress and casual town wear. Some kimonos being offered, as well as accessories, are washable. The Kimono Sale runs 9 a.m. to 6 p.m. both Sunday and Monday at the Kadena Officers Club. The Sale at the Okinawa Convention Center Meeting Room A-2 will run noon to 7 p.m. on the 29th, and 10 a.m. to 6 p.m. on the 30th.